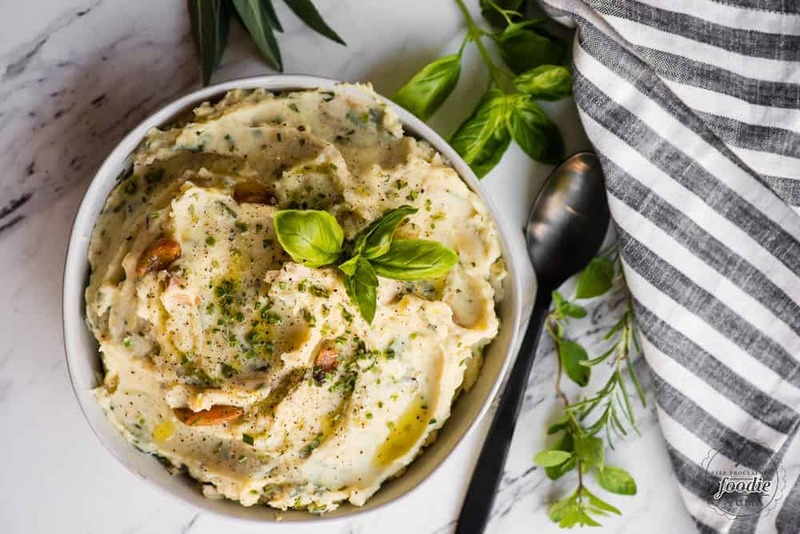 Roasted Garlic Herb Mashed Potatoes are the best homemade mashed potatoes. This easy dinner recipe is so creamy and loaded with flavor. 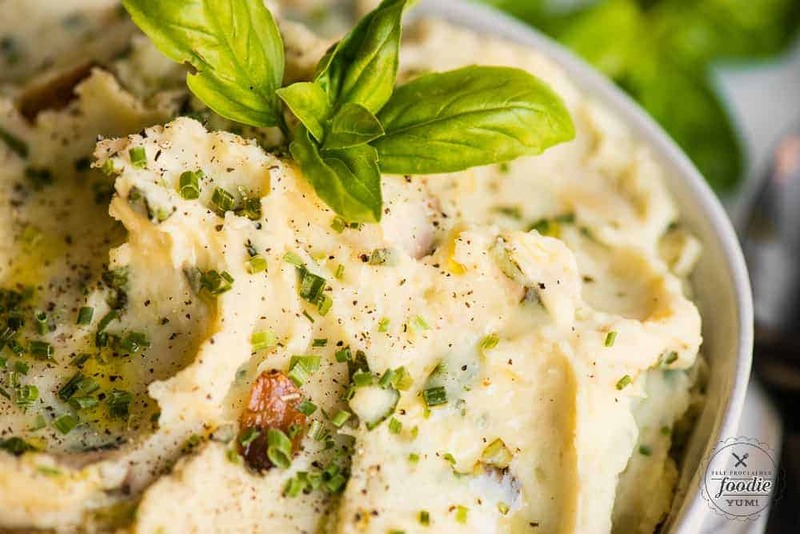 Whether you make them in the crockpot, Instant Pot, or on the stove, you’ll agree these are the most delicious mashed potatoes! Pin it to your SIDE DISH RECIPE BOARD to SAVE it for later! Who doesn’t love some really good mashed potatoes? 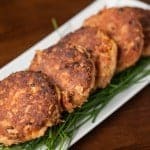 They’re basically the perfect side dish recipe that you can enjoy at dinner time! Can you imagine how good these roasted garlic mashed potatoes would taste next to a perfectly cooked prime rib roast? How about along side some homemade chicken parmesan? How about with some Slow Cooker Turkey Breast. Yeah. I thought you’d agree! 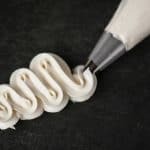 There are a few tips and tricks to making the most flavorful, creamy, downright delicious mashed potatoes, and I’ll share all my secrets! For this recipe, I add whole cloves of roasted garlic. Adding raw garlic to a side dish recipe like mashed potatoes can be too intense. Roasting garlic not only softens the texture, but it mellows the flavor and makes it a welcome addition to so many dishes. There are many ways to roast garlic, but I’ll share how I do it. Instead of using a head of garlic with the papery shell, I buy a big bag of peeled garlic. I line a baking dish with parchment, add as much garlic as I think I can consume over the span of a few weeks, then drizzle some olive oil on top. I roast this in a 350 degree oven for about 40 minutes while stirring every 10 minutes or so. Roasted garlic can go from perfectly golden to burnt in a matter of minutes, so be sure to keep an eye on it. What herbs taste best with mashed potatoes? I’m a huge fan of fresh basil, so that is my most recommended herb. When you’re cooking potatoes, you can’t go wrong with fresh chives either. Other herbs that I like to add to my mashed potatoes, but use more sparingly, are rosemary, oregano, parsley, and sometimes a bit of sage. 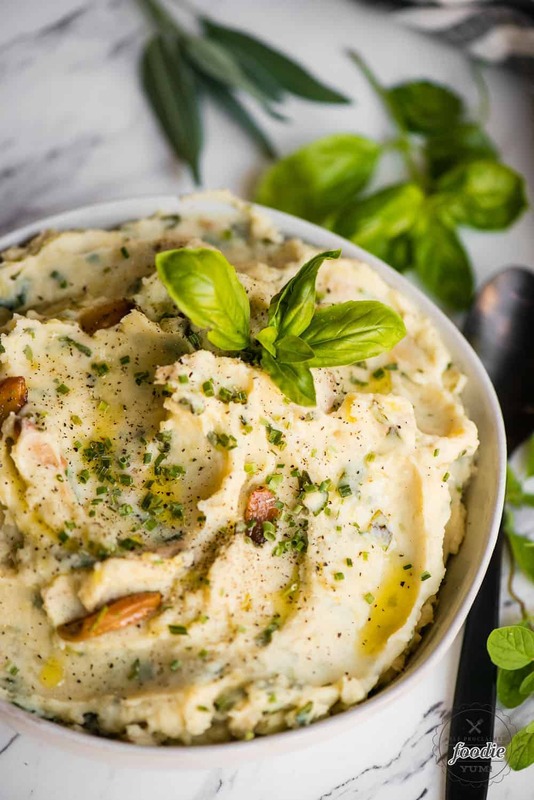 When adding fresh herbs to recipes like garlic mashed potatoes, it’s more of a matter of personal preference. I love to cook potatoes in broth. 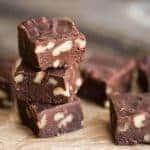 For this particular recipe, I used beef broth but you can use any kind that you like. Cooking potatoes in the Instant Pot is my preferred method. Not only is it the quickest way to make mashed potatoes, but I find that it makes them super soft and moist. You can also steam them on the stove top if you don’t have a pressure cooker. Likewise, you can cook the potatoes and broth in your slow cooker on high for 1-2 hours or low 4-6 hours. Since I love the Instant Pot so much, I only now use my crockpot to keep my mashed potatoes warm if I make them ahead of time. I’ve found that equal portions of butter and cream cheese make the creamiest mashed potatoes. If you haven’t tried it, you must! 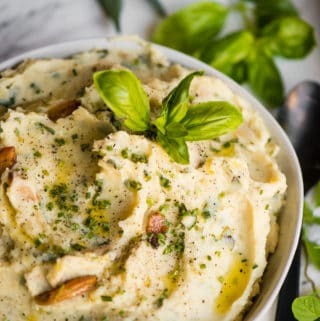 Roasted Garlic Herb Mashed Potatoes are the best homemade mashed potatoes. This easy dinner recipe is so creamy and loaded with flavor! Clean potatoes and cut into 1-inch sized pieces. Cook in covered pot over medium heat in broth until very tender, about 30-40 minutes. Alternatively, cook on high pressure in electric pressure cooker for 12 minutes. 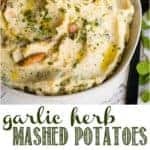 Add cream cheese, butter, roasted garlic, herbs, salt and pepper to cooked potatoes and mash together until well blended. Add additional salt and pepper, if needed. 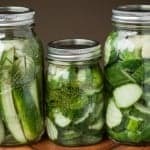 This post was originally created for The Recipe Critic where I’m a contributor. First, I love that you use broth instead of water. Secondly, cream cheese is interesting. I typically use butter and heavy cream. Thirdly, I can’t wait to make this!!! Yeah… I had never put cream cheese in my mashed potatoes until last Christmas when my mother-in-law did it and I was pleasantly surprised!